Ian realises that the footprint could be just an ordinary one enlarged by the snow melting. A more serious problem soon presents itself as the Doctor reports that the TARDIS has developed a major fault: all the lights have failed, the water supply has been affected and the heating is inoperative: 'Everything's gone to pot!' As Barbara points out, they are now in danger of freezing to death. Exploring the snowy plateau, the travellers are confronted by a group of Mongol warriors led by a man named Tegana (Derren Nesbitt), who prepares to have them put to death as evil spirits. They are saved by the arrival of a man of European appearance whom Barbara later identifies as the Venetian explorer Marco Polo (Mark Eden). The year is 1289 and Polo is taking a caravan from the Pamir Plateau - also known as the Roof of the World - across Cathay en route for the court of Kublai Khan. He is accompanied not only by Tegana, an emissary from the rival Mongol warlord Noghai, but also by a young girl named Ping-Cho (Zienia Merton) who is to undergo an unwelcome arranged marriage to a 75-year-old nobleman at the Khan's summer palace in Shang-Tu. Polo seizes the TARDIS, intending to present it as a gift to the Khan in the hope that he may then be allowed to return to his native Venice, and the Doctor's group have little choice but to join the caravan. Tegana also secretly plans to steal the TARDIS, but for his own master Noghai. Mistrust and acrimony abound as the caravan makes its way across the Gobi desert and through Cathay, stopping every so often at way stations along the route. 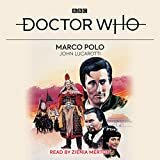 Tegana and his Mongol allies make a number of unsuccessful attempts to kill the rest of the party, but the time travellers are unable to convince Marco Polo of the man's treachery or to regain access to the TARDIS, which the Doctor has in the meantime managed to repair. The caravan finally arrives at the Khan's summer palace in Shang-Tu, where the travellers have an audience with the ageing leader. The Doctor and the Khan (Martin Miller) strike up a cordial relationship, which continues when the whole party moves on to the imperial palace in Peking. This leads to a game of backgammon between the two old men, with the TARDIS as the prize. Unfortunately, the Doctor loses. There is some good news, however, as Ping-Cho learns that her intended husband has died after drinking an aphrodisiac, allowing her to continue her romance with the dispatch rider Ling-Tau (Paul Carson). Tegana now plays his hand: his true intention has always been to assassinate the Khan, leaving the way clear for Noghai's army to attack and overrun Cathay. Marco Polo, having been alerted by the time travellers and Ling-Tau, saves the Khan's life by engaging Tegana in a sword fight and overpowering him. Humiliated, the Mongol takes his own life by throwing himself upon a sword.